This page is about the heavy tank KV-1 (ZiS-5). For other uses, see KV-1 (Disambiguation). The KV-1 (ZiS-5) is a Rank III Soviet heavy tank with a battle rating of 4.7 (AB) and 4.3 (RB/SB). It was introduced in during the Closed Beta Test for Ground Forces before Update 1.41. 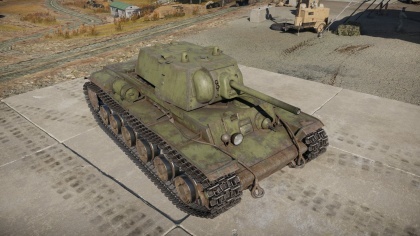 This KV-1 introduces a new armament, the ZiS-5, that has a much stronger punch than the L-11 from its predecessor while retaining the same armour. This tank is very similar to its predecessors, but mounts the same gun of the T-34 (1942) sharing its ability to fire APCR shells. The player should feel at home once going through the KV-1 (L-11), and while not as fast as the KV-1S, it maintains more armour all-around. The gun may be lacking on penetration unless using APCR shells, its velocity is poor (makes it harder to aim in Realistic Battles), but will do plenty of damage once penetrated and reloads quite quickly. The armour is outstanding when angled. With extra 25mm spaced armour at the front of the hull results in total of over 100mm of armour. The tank can take a lot of damage from lower ranks and still survive the battle. The turret remains vulnerable however, but turret ring is reinforced, which means that it's harder to jam the turret. Lower glacis applique armour do not cover the entire plate. The turret ring is protected by applique armour that are 25 mm thick, the front hull also has the benefit of having top part of the applique armour on the front plate also covering the path to the turret ring. The gun mantlet is extra protected with additional 90 mm plates added on, resulting in a very thick front turret armour. This is added with 45 mm plates on the very top and bottom of the gun shield. The side cheeks of the front armour are still vulnerable due to their small slope angles. The KV-1 ZiS-5 armour is still relatively strong at the hull, taking the base armour of the original KV-1 L-11 with extra armour added on. While the mobility is subpar and firepower is the same compared to the more ubiquitous Soviet T-34 medium tank, they can still be a threat if ignored. If facing an unangled KV-1 face-on, the front hull plate is still a popular place to attack on with a high-velocity anti-tank weapon. The side hull is also an enticing place to hit as not only is it a flat 75 mm armour, the mass of fuel and ammunition are behind there. However, an angled KV-1 ZiS-5 is rather tough for any tank gun, with the tendency to bounce rising. However, the turret armour is still a vulnerable place to hit no matter which way the hull is angled with. Facing from the front, the turret cheeks, front, and the gun mantlet could be penetrated by most guns to either disable the gun or incapacitate the turret crew. An APHE through here could cripple or destroy the entire tank in one go. Ammo racks of the KV-1 L-11 (identical as KV-1 (ZiS-5)). The KV-1 ZiS-5 plays like a standard heavy tank, with heavy armour able to soak up shells while angled and a decent 76 mm gun to fire back. While mobility is not the greatest, it is sufficient to get up to the front lines in time for the battle. Compared to its predecessors, the KV-1 ZiS-5 serves as a continuation rather than a big improvement, with the ZiS-5 gun the KV-1S had while sacrificing mobility for more armour. Careful usage of the KV-1 ZiS-5 is needed due to its matchmaking compared to its predecessor. Its only distinctive perk is the armour, with the 76 mm gun already serving in the T-34 and KV-1S while mobility is only subpar. The matchmaking puts the KV-1 ZiS-5 against more powerful opponents in an uptier, which one could find themselves unable to penetrate from the front. 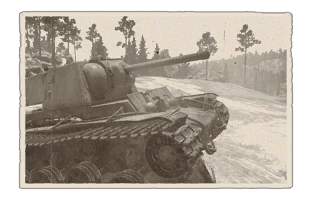 Enemies at the same time will be able to penetrate the KV-1 easily through common weak points in the last two iteration, flat on the side hull armour or through the turret front. However, the KV-1 can still be a significant factor in the battlefield if played in the right circumstance. The boxy shape of the overall tank encourages angling, which can make the hull armour nigh-invulnerable by its contemporary guns, so do that. The biggest concern in survivability then will be the turret armour, and so try to minimize the risk of a straight-on hit onto the turret front by any means necessary, like the "turret wobble." In a downtier or fighting its battle rating contemporaries, the KV-1 ZiS-5 can handle its ground. Its armour is sufficient alone, with angling being a bonus, and the 76 mm can be a strong gun with its BR-350A/B APHEBC ammunition. In these situations, the KV-1 can serve as the front-line assault tank. Take the front lines with the teammates and serve as a bullet sponge (while angling). Allow the enemies to be concerned about the KV-1 presence and fire at it while the KV-1 should worry about staying alive. If enemies are not concerned about the KV-1 ZiS-5, then make them concerned with the 76 mm gun. With teammates, the KV-1 ZiS-5 can have enough supporting fire so that enemy tanks do not have an opportunity to outmaneuvre the KV-1 to hit weak points. Thus, outside of tank destroyers and the typical high-velocity 75 mm guns, the KV-1 can be a menance to the enemy team. In an uptier however, as mentioned the KV-1 ZiS-5 will be more easily destroyed by the tougher enemies and guns. In these situations, the tactic of being an assault tank or a bullet sponge will be short-lived as a well-placed round will penetrate through the armour, plus the 76 mm may no longer be sufficient in penetration outside of the APCR ammunition. In this new position, act more as a support tank. Follow behind more capable allied tanks and assist them by bringing another gun into the equation. If they are occupied with one enemy in front, maneuver around while that enemy is concentrated on the ally and force them to split their combat vision. If an enemy tank is trying to flank the ally, then fire at them to throw them of their course of action by having to worry about the KV-1 as well. Another way to use the KV-1 in an uptier is to cover flanks and set up fire zones. While the KV-1's armour in an uptier is not sufficient for a straight up fight, move along the flanks to engage on more mobile, but less armoured vehicles like light tanks trying to get around. If in a good position, set up a fire zone to watch for enemy tanks moving carelessly around, unaware of the KV-1 presence. In these cases, wait for the right moment to strike towards their side armour with a APHE round to quickly devastate their interior. Thus, the KV-1 can still be a major player in shutting down enemy movements in the right position, just ensure the lack of gun depression is taken account of in the firing angles. In short, a more diverse play style is needed to accommodate the enemies the KV-1 ZiS-5 can face that its predecessors will not. Since the KV-1 ZiS-5 armament hasn't drastically improved while the potential opponent pool has, there will be times when the KV-1 ZiS-5 be facing enemies that cannot be penetrated from the front. The poor armour, large profile, and cramped interior means a penetrating round by any tank could be lethal. High battle rating vehicles like the Tiger I heavy tank have guns able to defeat the KV-1 ZiS-5 with ease, while the 76 mm gun is nigh useless at ranges. However, in close ranges towards flat angled armour, the 76 mm BR-350P APCR ammunition can penetrate through flat armour, especially that of the Tiger I while under 250 meters. APCR is discouraged against highly-sloped armour, so facing against even the M4 Shermans will have the front armour hard to hit through with the APCR, so the APHEBC rounds should remain the standard round, even if the penetration is not up to par anymore. Good penetration value, especially with APCR shells. Additional armour plates gives this tank very effective hull armour up to 100 mm thick. One of the few Russian tanks with a full 5 man crew. 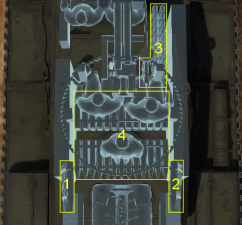 Eliminates the turret ring weakness from the previous KV-1 model with additional plates. Decently fast for a heavy tank. Very hard to knock out in 1 hit. Turret shape tends to bounce rounds off. Rear mounted transmission prevents front hits from immobilizing via components. Able to resist the up-gunned Panzer IVs at ranges >500m. Invulnerable at at all angles to 20 and 37mm autocannons. Maneuverability and HP ratio are below average, making you vulnerable during displacements. Turning will bleed off speed very quickly. Driver's port is not covered by the additional armour. Turret can easily be penetrated from the front with most weapons. Relatively cramped interior can cause one penetration to devastate many modules. May be unable to compete with standard ammo in uptiers. Expensive APCR shells requires conservation so battle costs don't exceed gains. Sides are weak points with large fuel tanks and ammo stowage, a penetrating round has a high chance of striking one of these. The start of the KV-1 heavy tanks began after the heavy tank T-35 flaws came to light. Designers were ordered to draw up new designs to become the basis of a breakthrough heavy tank needed for the Soviet doctrine. This made for a tank that was heavily armoured, but not very mobile as it was to be for siege warfare. The designs offered all had heavy armour, wide tracks, and used the torsion-bar suspension. The designs were the SMK, T-100, and what would be the KV tank, which was named after the then Soviet Defense Commissar Kliment Voroshilov. During the developmental progress, the prototypes of all these heavy tanks were made and the Winter War with Finland was on its way. The Soviets sent these tanks into Finland for combat testing, to which the KV design outperform in every way with its superior armour and firepower. The armour on the KV tank was impenetrable by an tank cannon in service and most anti-tank guns as well, the 76.2 cannon also gave it a huge firepower boost compared to the usual 37 mm in use by other countries. However, the design was found to be difficult to steer, the transmission was unreliable, ergonomics was poor and vision was limited, plus with its 45 ton weight, it was a very heavy tank for its time. In truth, while formidable in power and protection, courageous crew member willing to curse the name would speak out about the trouble the KV tank really was. The main variant of production before World War II broke out was the KV-1 model. The ZiS-5 model used the newer and improved F-34 76.2mm gun instead of the L-11 that equipped the early models or the shorter F-32 as both were deemed insufficient in performance. When Germany invaded the Soviet Union in 1941, the Red Army had 508 of the KV tanks. This shocked the German forces as their anti-tank and tank forces had few weapons capable of defeating it, having to rely mostly on the 88 mm Flak guns and the 5 cm Pak 38 with APCR rounds. But by 1942, Germany fielded large amounts of long barreled 50 mm and 75 mm cannons in both tanks and towed format, making the KV lose much of its armour advantage. Perhaps the most famous moment of glory for the KV-1 was at Krasnogvardeysk near Leningrad on the 19th of August 1941 when 5 KV-1s, led by Lt Zinoviy Kolobanov, ambushed the German 8th Panzer Division (a light panzer division consisting mainly of panzer II, III and 38(t)). But there are some contradicting stories about what happened, and even if it indeed did happened. One story that supports the claim goes like this: each of the five KV-1s were hiding at different locations, came out one by one to fire at the incoming German tanks, then retreat before the next tank could come out. This boxed an entire tank and ended with 43 tanks destroyed before the KV-1 tanks retreated from running out of ammo, all in a span of about half an hour. During this battle, one of the KV-1 tanks was struck 135 times with no penetration. For their feat, Lt Z. Kolobanov and a few officers were decorated the Order of Lenin and Order of the Red Banner. The KV-1 continued to serve until the end of the war, though in dwindling numbers as they were lost due to mechanical failures, combat, and being superseded by more modern tanks. Some KV-1s built in 1941 still saw service in 1944 at the Leningrad front before being replaced by IS-2 tanks, then they saw service in Manchuria in 1945 before being retired altogether at the end of World War II. Many variants of the KV tank would be produced in the span of World War II as the Soviet try to keep it in production as long as possible, the initial version was called the KV-1 and remained most part as the main Soviet heavy tank for the first part of World War II. A bunker-buster variant mounting a 152 mm howitzer after experiences in Finland brought the monster KV-2 assault tank, which is very turret heavy that it must be on a flat surface to properly rotate. After complaints of its mechanical issues and lack of performance compared to the lighter T-34 medium tank was heard, the factory lightened the tank in 1943 and designated as the KV-1S which presented some good features into the tank like a commander's cupola. But the KV-1S introduction was a little too late as then the better German tanks such as the Panther tanks could knock them out with ease. An attempt to up-gun the KV-1S was to give it the 85 mm D-5T gun then in use on the SU-85. This variant was called the KV-85. Though it was seen favorable for a nice increase in firepower among the armoured forces, soon even the lighter T-34 began mounting the 85 mm gun as the T-34-85. It was determined that the heavy tank would have a much bigger gun than the medium tanks, but at the time the KVs were falling out of favor in preference to the newer IS-1 and IS-2 heavy tanks coming into service, which were based off the KV-13 prototype tanks developed in 1942 as a medium tank. Several KV-1s survive after the war, most as monuments, but also in museums. Only one genuine KV-1 was restored to running condition in Russia after it was found in the bottom of the Neva River. (Historical, 1942) "Merciless" 12th Tank Regt. Scale model conversion - "213"
Girls und Panzer "Pravda school"
This page was last edited on 19 March 2019, at 16:35.